ISF-Qt is a library, written in C++ with the Qt 4 toolkit, which is capable of reading and writing the ISF format. 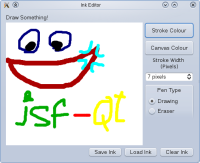 ISF stands for "Ink Serialized Format", and is the disk serialization format used by the Windows.Ink C# library and by the TabletPC platform, but also by applications like Windows Live Messenger - which uses ISF to transfer handwriting messages. We had the need to interpret these handwriting messages in the best possible way, and started to reverse-engineer the format, with the help of existing (but incomplete) libraries and specifications. What we ended up with is ISF-Qt, a library which can be used to decode an ISF file or data stream, manage it and the the strokes which comprise the drawing, and write ISF files/streams. You can also create new drawings from scratch, of course! When you download ISF-Qt, you will obtain the library itself, a Qt4 widget you can include in your application to draw with ISF freely, and the Doxygen-generated documentation. 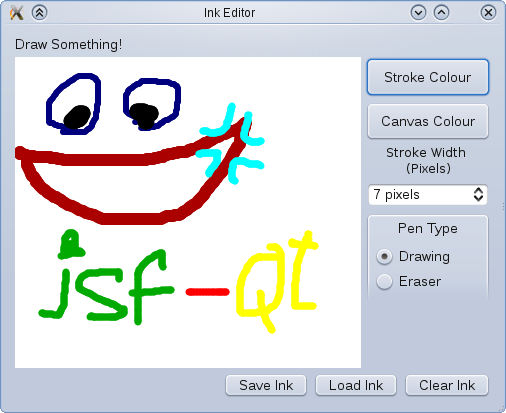 There also are some tests, among which you can find a simple drawing application (which uses the aforementioned widget) useable to try ISF-Qt out, by drawing, erasing, loading and saving pictures. Read below for a comprehensive list of features. At the moment, ISF-Qt has not yet been released. It's approaching fast to the 1.0 milestone though, and we should be able to release it very soon!